Elio, a young Italian man, feeling upset and confused when it felt herself madly in love to the man from American guests who stay at home during the summer. Not sure of his own, he tried hard to deny the feeling of an unnatural attraction. Though aloof and more clever mix with books than with men, physically he is very interesting and a lot of women chasing him. Unexpectedly, Elio not unrequited. Oliver turned back his feelings. At the end of that summer, they went to Rome before Oliver returned to his country. In town, they find the warmth and togetherness that is rarely total owned another pair, not realizing that was the last time they could together. Oliver then returned to America and married a woman. Feeling betrayed, heartbroken Elio who refused to meet with her ​​lover. However, lifetime he could not escape the shadow of Oliver. He waited years to ensure that their feelings are not just love the season. This novel tells the story twists and turns forbidden love with all the dilemmas and drag ulurnya. Elio and Oliver's relationship was also marred their relations with numerous women branched. 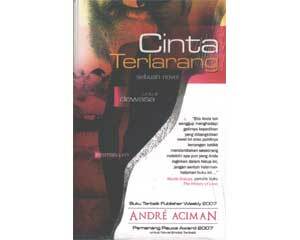 This novel is not only readable, but also entertaining and at the same time opening our insights about the meaning of love and sacrifice.